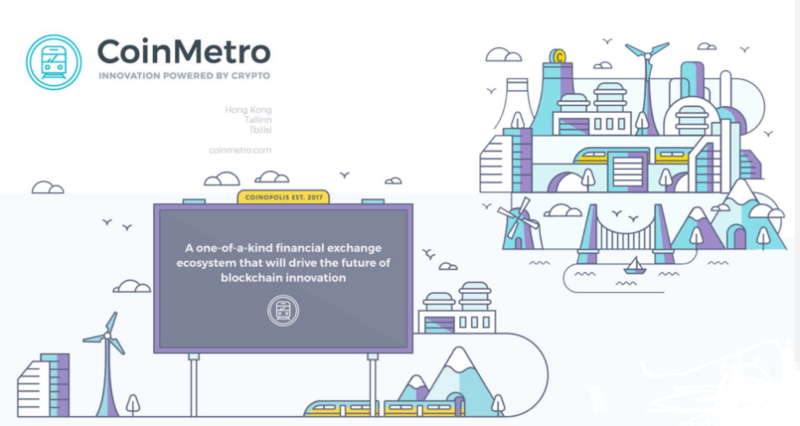 Hong Kong: CoinMetro, the financial platform fuelling the future of blockchain innovation, today announced the creation of its new trading platform, CoinMetro Exchange. The platform will streamline cryptocurrency investing for the general public, along with professional and experienced currency traders, offering a complete trading environment for all investors. CoinMetro Exchange is a one-stop all-in-one trading platform designed for global adoption. The trading platform translates familiar investing methods into the world of cryptocurrency, such as professional tokenized asset management and exchange traded crypto funds. Created by the team behind FXPIG, the regulated forex broker that has transparency at its core. Before the principal token sale, individuals may participate in the pre-token sale to take advantage of exclusive opportunities including discounts and bonuses. CoinMetro has been created by the team behind the regulated Forex broker, FXPIG. CoinMetro delivers an innovative user-focused framework that offers mobility between blockchain-based digital assets and mainstream markets. Combining the three major components of the digital economy: a cryptocurrency exchange, a trading platform, and an ICO platform. It offers a ‘one-stop shop’ cryptocurrency trading environment that is customer-centric to its core. Offering buying, selling, investing, trading and cashing out services, it will provide a positive consumer experience from initial query through to trading and into post-transaction. CoinMetro translates familiar investing models to the world of cryptocurrency. Drawing on FXPIG’s substantial experience developing technology for financial trading environments and understanding of the liquidity needs of currency markets, CoinMetro is uniquely positioned to support the trading needs of investors in cryptocurrencies, either allowing them to diversify existing portfolios or access the crypto markets for the first time. Powered by the COIN (XCM) token, its unique Tokenized Asset Management (TAM) system allows individuals to directly invest in a professional asset manager’s portfolio, based on their trading performance. Similar to earning a commission, managers profit from dividends, and investors benefit through the potential growth of their investment. Investors can quickly move funds between managers, and other crypto or fiat assets, and can withdraw funds using CoinMetro’s debit card from millions of ATMs around the world. Innovating on the concept of ETFs, Exchange Traded Crypto Funds (ETCFs) will give access to curated baskets of digital assets which can be traded in real time on the exchange. With one click, users can invest in specific industries, such as healthcare, IoT, communication, or finance. In addition, users can select an investment fund based on its risk profile or even the social media influencer scores of those inside the fund. CoinMetro will offer a powerful turnkey ICO Express Platform that will give vetted ICOs access to transparent and secure funding rounds. CoinMetro’s team will formally review all aspects of token sale proposals, including project feasibility, idea novelty, financial justification, and legal compliance. Through our proposed interface, users will be able to issue tokens and ICO contracts using input parameters. Tokens issued through CoinMetro will be liquid and immediately tradable on the CoinMetro exchange following the token sale. A platform for all, CoinMetro will allow newcomers to the digital economy to get started with buying their first Bitcoin and professional traders will enjoy a fast, secure, and highly flexible environment. Mass adoption of cryptocurrencies needs a marketplace that is accessible to all. Even for tech-savvy people, it can be a daunting task to purchase their first Bitcoin, Ethereum or other Altcoins. We want to change that. Creating a user-friendly platform does not have to come at the expense of functionality. The crypto space is evolving at a feverish pace, expanding into an ever-growing list of industries embracing blockchain. However, like most industries that begin to expand quickly into the public consciousness, it needs structure and guidance. From a pure finance standpoint, it needs reliable external price discovery mechanisms. The FX industry is a great partner to have; a great partner that can help solve this issue while creating a more stable alternative investment ecosystem on the back of trade-tested technology. Integral to CoinMetro is the relationship with FXPIG. A crossover of team members, technology, and revenue from FXPIG enables CoinMetro to bring industry experience, technology, and proven models into the CoinMetro platform. The CoinMetro pre-token sale is in progress, visit https://www.coinmetro.com/ to participate or join our public Telegram channel https://t.me/CoinMetro. Before the initial token sale, individuals may participate in the pre-token sale to take advantage of exclusive opportunities, opportunities that are usually only available in private pre-sales. During the period of the pre-token sale, the price of each COIN (XCM) will start at 0.03 EUR. The price will increase by 0.02 after every 12,500,00th COIN is sold. The pre-token sale cap is set to 50 million COIN. Any COIN not sold during the pre-token sale will be carried over to the token sale. Pre-Token Sale contributors are eligible for a bonus of up to 500%. Vesting rules apply to early investors. Find out more on the CoinMetro website here. CoinMetro is a trading platform bringing cryptocurrency into the mainstream. Offering a complete and supportive financial platform, CoinMetro provides an avenue for both newcomers, as well as professional and experienced currency traders to begin trading in cryptocurrency. Through a tokenized ecosystem, the trading platform supports familiar investment options such as professional asset management and ETFs, and also allows users to invest in up-and-coming Initial Coin Offerings (ICOs). CoinMetro has been created by the team behind the regulated Forex broker, FXPIG.